Immunohistochemistry-Paraffin: Choline Acetyltransferase/ChAT Antibody [NBP1-30052] - Rat brainstem showing specific labeling using the anti-ChAT antibody. Image courtesy of Dr. Robert Sloviter, University of Arizona. 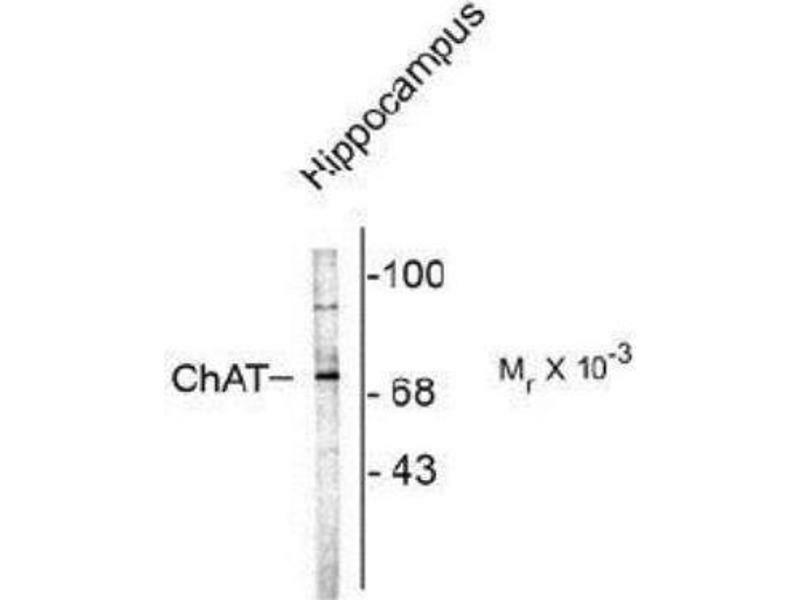 Western Blot: Choline Acetyltransferase/ChAT Antibody [NBP1-30052] - Rat brain lysate showing specific immunolabeling of the ~70k ChAT. Indications d'application Western Blot 1:100, Immunohistochemistry 1:100, Immunocytochemistry/Immunofluorescence, Immunohistochemistry-Frozen, Immunohistochemistry Whole-MountUse in Immunohistochemistry-Frozen reported in scientific literature (PMID 21912682) Use in Immunohistochemistry-whole mount reported in scientific literature (PMID 24630395) The observed molecular weight of the protein may vary from the listed predicted molecular weight due to post translational modifications, post translation cleavages, relative charges, and other experimental factors. Mellone, Zianni, Stanic, Campanelli, Marino, Ghiglieri, Longhi, Thiolat, Li, Calabresi, Bezard, Picconi, Di Luca, Gardoni: "NMDA receptor GluN2D subunit participates to levodopa-induced dyskinesia pathophysiology." 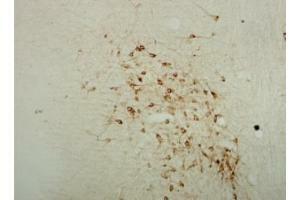 dans: Neurobiology of disease, Vol. 121, pp. 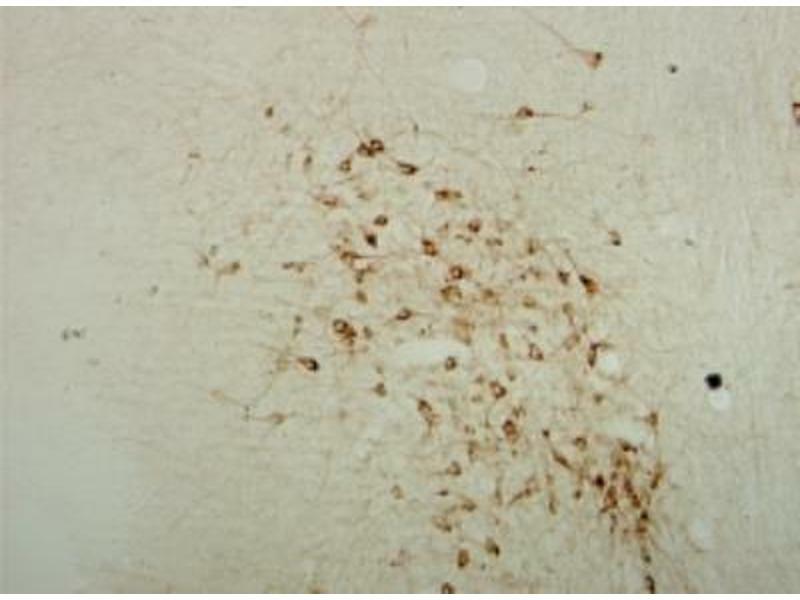 338-349, 2019 Méthode utilisée: Immunohistochemistry (Free Floating) (IHC (ff)) (Échantillon (espèces): Rat (Rattus)). Bonsi, Ponterio, Vanni, Tassone, Sciamanna, Migliarini, Martella, Meringolo, Dehay, Doudnikoff, Zachariou, Goodchild, Mercuri, DAmelio, Pasqualetti, Bezard, Pisani: "RGS9-2 rescues dopamine D2 receptor levels and signaling in DYT1 dystonia mouse models." dans: EMBO molecular medicine, Vol. 11, Issue 1, 2019 Méthode utilisée: Immunofluorescence (fixed cells) (IF/ICC) (Échantillon (espèces): Mouse (Murine)). Burstein, Valsecchi, Kawamata, Bourens, Zeng, Zuberi, Milner, Cloonan, Lutz, Barrientos, Manfredi: "In vitro and in vivo studies of the ALS-FTLD protein CHCHD10 reveal novel mitochondrial topology and protein interactions." dans: Human molecular genetics, Vol. 27, Issue 1, pp. 160-177, 2018 (Échantillon (espèces): Mouse (Murine)). Sun, Li, Hu, Huang, Sun, Yang, Wu, Ji, Zhou: "Aging-dependent decrease in the numbers of enteric neurons, interstitial cells of Cajal and expression of connexin43 in various regions of gastrointestinal tract." dans: Aging, Vol. 10, Issue 12, pp. 3851-3865, 2018 Méthode utilisée: Immunofluorescence (fixed cells) (IF/ICC), Western Blotting (WB) (Échantillon (espèces): Mouse (Murine)).